But as noted it was all brought crashing down in seconds. Within seconds of the start of the race that is. 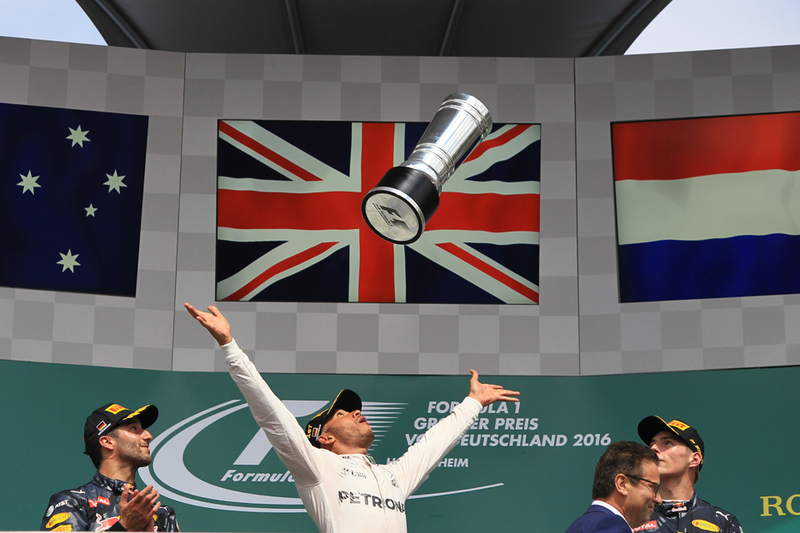 Lewis spoke of getting a 'perfect' launch; perhaps his best of the season. He spoke too about in advance visualising his seizing of the lead at turn one. These helped, but the main part in it all was that Nico's start was a stinker. 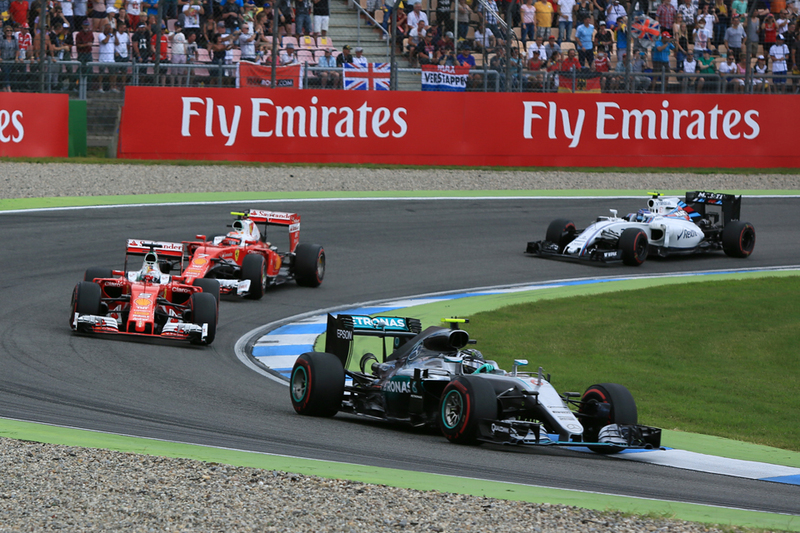 In a flash he was down in fourth, behind the Red Bulls as well as Lewis who helped himself to a lead that even at that point instantly no one saw him losing. And sure enough he didn't. "The initial getaway looked to be OK" said Mercedes boss Toto Wolff of Rosberg's launch later, "but probably the clutch was a bit over-engaged and caused a lot of slip in the second phase." In a blink it was all like Nico's imperious previous two days had never happened, which of course they may as well not have done. Lewis then simply controlled matters out front like he had done in Hungary last week. He didn't back up the pack as he did then, as after all unlike at the Hungaroring you can pass here, but the objectives were the same and the approach similar, as was the eventual outcome. This time he managed a reasonable lead to the next guy for the race's duration, never gargantuan but always comfortable - somewhere between five and ten seconds for the most part. Just as in Hungary too he was conscious in managing his tyres and especially his now long-in-the-tooth power unit. His lead therefore fluctuated depending on his level of economising at that moment, but his control never wavered. "I turned down my engine pretty much from the second or third lap" said Hamilton afterwards, "when I needed to I was able to switch it back on and eke out the gap I needed. "At the end I was trying to make that engine go as far as possible...you just don't know when it's going to go." The sheer contrast with the day before as he bounced around the anteroom, the podium itself, then gave his inimitable philosophy of life later, could not have been greater. "I think today I didn't make any mistakes" Lewis gushed, "so in my heart I'm happy with what I did today. I came to do a job. "Yesterday wasn't perfect, but you learn from those things and today was a real show of looking at the glass half full and filling it up." Not that such Saturday to Sunday turnarounds are that unlikely from him, we've seen them plenty before. As James Allen said of Lewis on Saturday evening, when he's up he's up and when he's down he's down. Like the Grand Old Duke of York. As for the man himself, on Saturday he insisted in reference to his demeanour "that's just how I deal with it. You know when you kind of kick yourself a little bit?" And amid his gloom we perhaps should have paid more attention to his notes of defiance too. "I'm not down...I've got a race to win tomorrow" he asserted then. Well he made good on it. As for Nico, his day actually got worse from the point of his poor launch. First off he routinely was overheating his tyres, costing him grip, something that Wolff thought was a set-up problem. "We had not really a good set-up overall" he said of Nico's Merc, "and he was lacking grip. When he was trying to go faster and trying to attack he probably overheated the tyres and lacked pace." 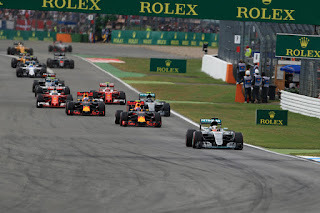 Nico did though manage to battle his way up to second and was aided especially by a fine, from a mile back, outbraking of Max Verstappen at the hairpin just after their second stops. The stewards though chose to slap Nico with a five-second time penalty for 'forcing another car off the track' in the move. Initially the decision seemed farcical and Nico maintained this view. "It took me by surprise, definitely [to get a penalty]," he said. "I didn't expect a penalty for that. It was racing. I was really ecstatic at the time because I thought 'wow, that was awesome, I came from miles behind'." Subsequent viewing though particularly from on-boards showed that - with echoes of Austria and all that - Nico seemed rather tardy in engaging his steering wheel for the turn and therefore may have known what he was doing. Wolff said though that at least there's nothing like steward consistency on this one. 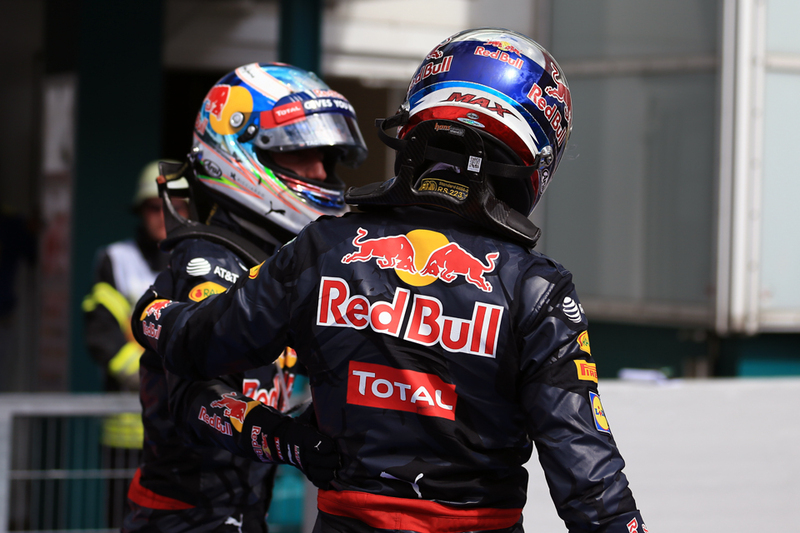 "People get pushed out of the circuit all the time, one has been penalised the other not. I can sympathise with the five-second penalty, it's not that I'm saying it was completely wrong it's just important to know if and when and what the penalty is" he mused. And then we got some real absurdity, as when Nico served his five-second penalty at his final stop his team gave him in effect an eight-second penalty before servicing his Merc. Curiouser and curiouser. But Wolff explained later it had a simple, but tragi-comic, explanation. "Even in a Formula One team with all the high tech if you get to take out an instrument you usually don't use like a stopwatch they can fail" he said, "and the stopwatch didn't start properly and once we realised we had to take it safe and this is why it took longer than normal...The damn thing failed." 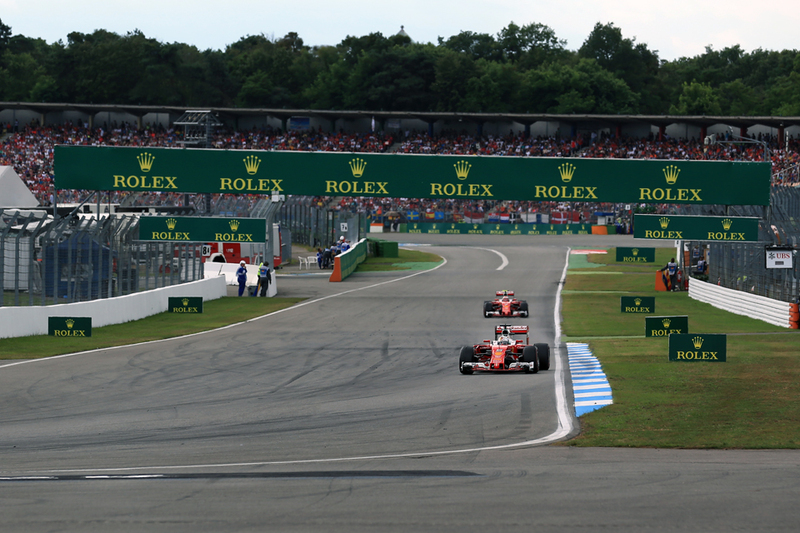 The upshot was that at the end Nico was in the same fourth place that he was in at the first turn. It means too that his deficit to Lewis in the table now gapes rather at 19. The Red Bulls were brilliant this weekend and not only split the Mercs but kept Lewis in some kind of range of honesty (it also was their first double podium in a year). It was a curious contrast too to Hungary when, perhaps in an exact mirror image to here, they were expected to go well and didn't. Max led the pair from the start but the team split strategies, putting the young Dutchman on the supersoft compound for his second stint, and when Daniel Ricciardo got the supersofts later on lower fuel the car came alive much more. Indeed there was a bit of synchronised swimming as Max let a clearly quicker Daniel through, and they finished in that order. The Milton Keynes pair refused to indulge in any rancour regarding the strategy call. "We chose to do two different strategies on the cars so I let Daniel by and from there on I think we played really well as a team," said Max resolutely. He refused to answer though if he would have done the same if leading. Ricciardo of course concurred on the approach: "a good little bit of teamwork for us and obviously the team was happy that we played nice and got maximum points today". For Ferrari though it was a day that ensures it slinks a little further into the mire. 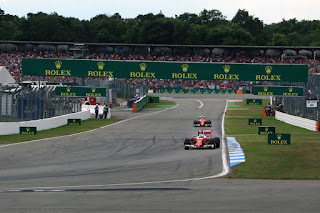 The red cars followed the Red Bulls home fifth and sixth, Sebastian Vettel ahead, but worse was that they both got there more than half a minute after Lewis did. Boss Maurizio Arrivabene later did not conceal that downforce is the issue for the car, and added that, amazingly, he doesn't feel the SF16-H has improved much in this regard since Barcelona in mid-May. Kimi Raikkonen too - while as we know he doesn't say much - tended to talk of downforce and the need for more of it whenever he did open his mouth as well. Nico Hulkenberg stayed out of trouble at home to come seventh, while Jenson Button salvaged something from an iffy weekend for McLaren by finishing eighth, judging his fuel load and tyres to perfection is a way his team mate Fernando Alonso apparently didn't. But the day was all about Lewis, now with six wins from the last seven, and as is oft-repeated by now his previous cliff-edge like 43 point deficit to the top of the standings now has been converted to an almost balmy 19 point lead of his own. "It's kind of crazy" Lewis went on, "it's gone by so quickly. It's almost like it was only a couple of weeks ago we were in Barcelona and I was 43 points behind and thinking jeez I might come away 50 points behind, and finding the heart to find my way through the woods...not giving up and just keep going and keep believing." 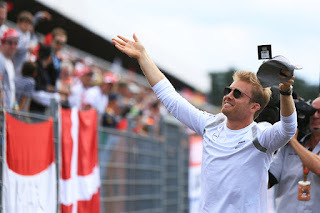 He also maintained the notion that despite his now healthy points advantage, with an engine grid penalty likely to be served in one of the two races after the summer break he yet remains in fact the nominal chaser. "[I] definitely feel different to being six points ahead" he reflected, "[but it's] still not enough, because I'm not a race win ahead yet." But, some have surmised, perhaps he prefers to play the hunter rather than the hunted; after all it is a status that has served him well lately. He may have had this in mind too when he noted after his latest victory that "I never feel invincible, or unbeatable either." But whether Lewis likes it or not, you won't find many that think he won't now remain the man on top for the rest of this 2016 campaign.